While millions of public dollars are going for bike lanes in Seattle, the city's data collection on actual bike-lane ridership is scattered and incomplete. Given they're the best the public can get, here's what those numbers can tell us about who's riding where. The Seattle City Council last month approved doubling the size of the private bike-share program and pushed to expand the city’s downtown bike-lane network by the end of next year. That prompts a question: How are the city’s existing bike lanes performing? The answer is murky at best. The city’s data collection on bike-lane ridership is scattered and incomplete. 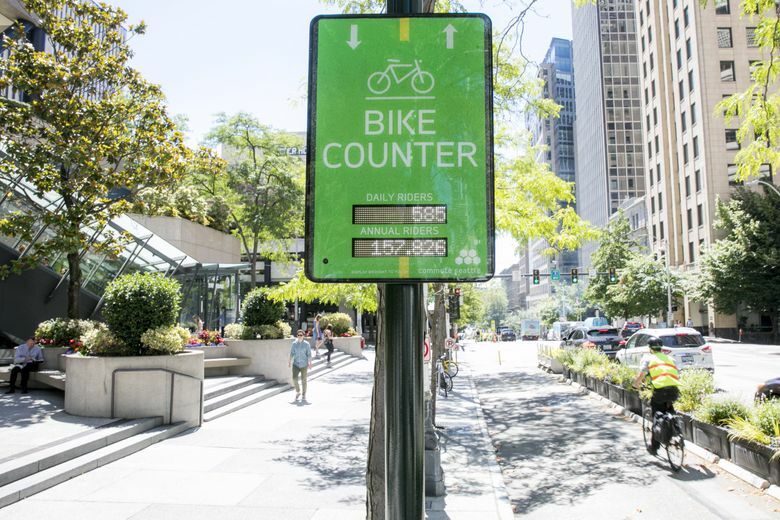 Ridership is measured at only 12 locations where the city has installed bike counters on neighborhood greenways, multiuse trails, protected bike lanes and at the Fremont Bridge. There are no counters on the protected bike lanes on Roosevelt Way Northeast, Dexter Avenue North or Westlake Avenue North, and only one bike counter on the Burke-Gilman Trail. A counter wasn’t installed on the recently completed Seventh Avenue bike lane downtown. Also, the counters frequently malfunction and don’t record riders — sometimes for weeks or months. 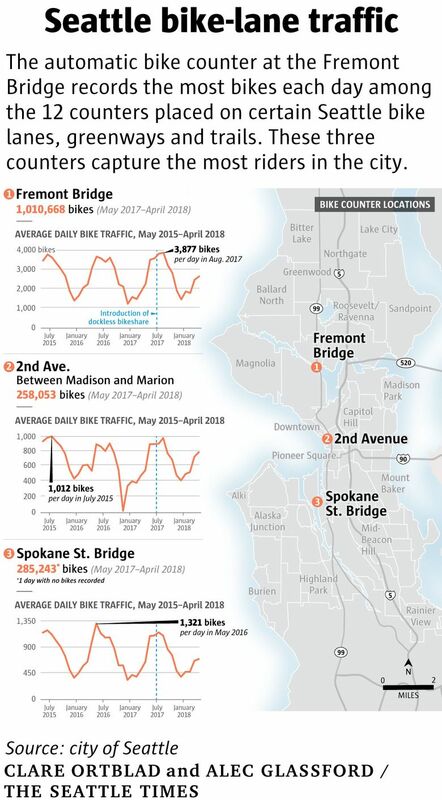 Counters at the Fremont Bridge, Elliott Bay Trail, Burke-Gilman Trail, Second Avenue and the Spokane Street Bridge are the most reliable. That makes trends difficult to decipher. Some of the more reliable counters show an increase in bicycle traffic since 2015, while others show large fluctuations and even decreases that transportation planners attribute to construction blocking bike routes or the lack of a connected network of bike lanes that would encourage cycling. The data do clearly show, not surprisingly, that ridership drops significantly during Seattle’s rainy-weather months. The period between October 2016 and April 2017 was the wettest since record keeping began in the city in 1895. Bike traffic went down almost across the board, with a 6 to 58 percent decrease measured on the counters. Dongho Chang, Seattle’s chief traffic engineer, acknowledges problems with the data. Still, for all their faults, the counters provide the only information publicly available about bike-lane use in Seattle. The Fremont Bridge serves as a primary route for bicyclists coming from north of the Ship Canal into downtown by way of Dexter or Westlake Avenue, so the counter there tallies the most riders. Nearly 4,000 riders passed over the bridge bike counter on the busiest days between May 2015 and April 2018. The bridge route funnels cyclists onto protected bike lanes headed into downtown. A network of protected and connected bike lanes is one of the most effective ways to boost ridership, transportation officials said. 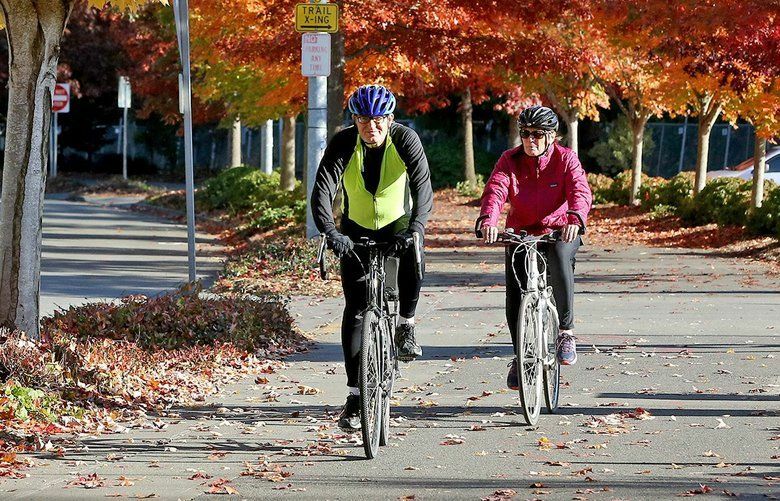 For decades, advocates have lobbied to fill the 1.4-mile gap in the popular Burke-Gilman Trail, an 18-mile, multiuse path that stretches from Bothell to Fremont before abruptly ending outside the Fred Meyer grocery store in Ballard. Bikers must travel on busy streets to reconnect with the trail at the Ballard Locks. The Elliott Bay Trail lacks a protected bike connection to the Second Avenue lane three blocks away. That’s also the case with neighborhood greenways — residential streets optimized for bicycles — which tallied the lowest ridership numbers. Alon Bassok, a research scientist at the Washington State Transportation Center at the University of Washington, said the 26th Avenue Southwest Greenway that runs through the Delridge neighborhood would likely see higher ridership if it were better connected to other bike routes. He also said any analysis should look systemwide when considering ridership, not just where a counter is located. For example, as more riders use the Seventh Avenue bike lane and the proposed Fourth Avenue bike lane — when it gets built — ridership on the Second Avenue bike lane may decrease, since cyclists would have more options for travel. “None of these routes can be taken in isolation,” Bassok said. Another challenge with numbers: The counters don’t all work the same. The counters on the Fremont Bridge, the Elliott Bay Trail, the Burke-Gilman Trail, Second Avenue and the Spokane Street Bridge use induction loops — circles of magnetic wire in the ground — to detect metal passing over them. That technology provides the most reliable data and is increasingly becoming the industry standard, Chang said. The other counters use two parallel tubes, which measure pressure and show direction of travel. While they convey general trends, Chang said, they are vulnerable to becoming loose or punctured, failing to detect riders. For example, the Mountains to Sound Trail counter shows a series of gaps in data, some lasting up to four months. Both methods “are typically known to undercount somewhat,” said Frank Proulx, a researcher at Toole Design Group who specializes in bike volume estimation. When traffic-counting technology became more available in the 1960s, transportation planning was focused almost solely on cars, Proulx said. Agencies submit vehicle traffic data to the Federal Highway Administration database, but the national organization doesn’t require bicycle or pedestrian data. So there’s no incentive to accurately measure that traffic. Some transportation experts said Seattle should have more bike counters, but the optimal number is an open question. “With this kind of a quickly growing area, I don’t think anybody has really fully figured it out in terms of how much is enough to have a really robust understanding,” Proulx said. In Vancouver, B.C., city officials use more than just bike counters to understand how people get around. The city has 40 bike counters, and data from 10 are made available online. Vancouver officials also ask about 2,500 people every year to complete a transportation diary that provides an account of their travels in the past week. And they conduct manual counts of bike riders on a few days each year to collect demographic information, such as the number of children or seniors using the bike network. “Our lesson in Vancouver is you need to round it out to have data that speaks to the health and safety and who you’re trying to build out the network for,” said Dale Bracewell, Vancouver’s manager of transportation planning.